In just 32 short days I'll be arriving in Santa Fe, NM to paint the dream I've had for the past year. What began as a "wouldn't it be nice" little dream last summer is now becoming reality. All that remains is figuring out the logistics for shipping my art supplies, confirming appointments with galleries and boarding the plane. I am excited and nervous both at the same time. March was a busy month creating new small artwork for April's First Friday in the Heights event at Cleanse Apothecary in Tampa. I haven't even had time to add all the new work to my website. I'll also have three artworks at Scarfone-Hartley Gallery at the University of Tampa for Las Damas de Artes annual Sunday in the Arts event this weekend. In between I try to find time to design new items for my VIDA fashion collection. 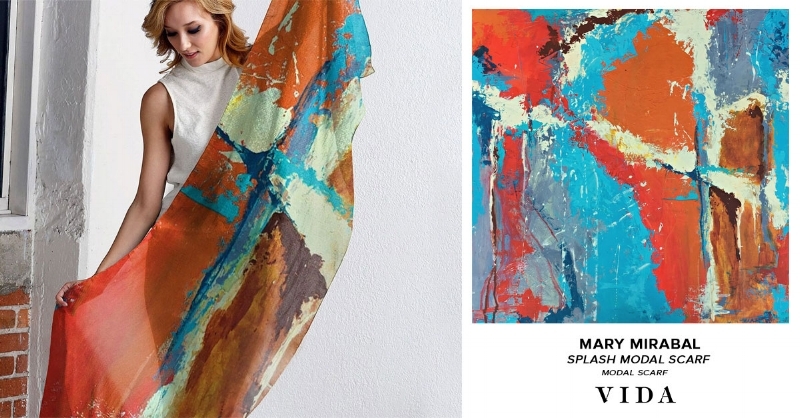 There are some lovely new items for Spring, especially the modal silk scarves. I'm just in love with these scarves. You can wear them as a wrap or tie them in multiple ways. This is just one of my new designs along with the painting that inspired the fashion. I'm working on new paintings, and hope to get them finished and ready for my website before I head off to Santa Fe for May and June. I treasure the time I get to actually paint in my studio versus the business side of art. Working on finding more creative time is a new goal. Speaking of being more creative, I took off last week to focus on my garden. I've neglected it so badly the past year. It's still very much a work in progress, but I am very happy I was able to bring some whimsy back by replanting my fairy gardens like this one. I hope Spring finds your neck of the woods soon friends. Here in sunny Florida it's in full swing, blooms, pollen and birds. We respect your privacy and promise to never share your personal information.